Rule #1 – If you won’t eat a crop, don’t grow it. (I break this rule for flowers. Edible or not, I like to see at least a few in every garden.) Focus on the fruits, vegetables or herbs that your family enjoys the most. Make sure your top choices make sense for your area. 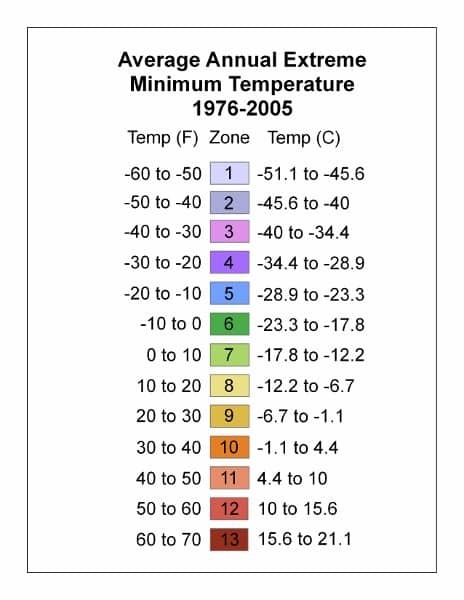 Figure out your gardening zone and estimated first and last frost dates. 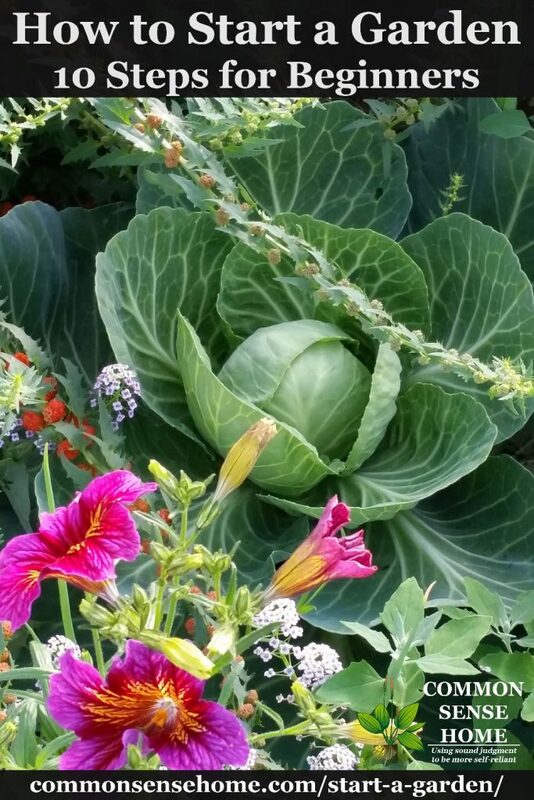 If possible, talk to successful gardeners in your area to find out which crops grow well and which don’t. In my northern garden, crops that take over 100 days to mature or high temps are a gamble. For example, we enjoy watermelons, but I stick to varieties like Blacktail Mountain (70 days) instead of Carolina Cross (90 days). 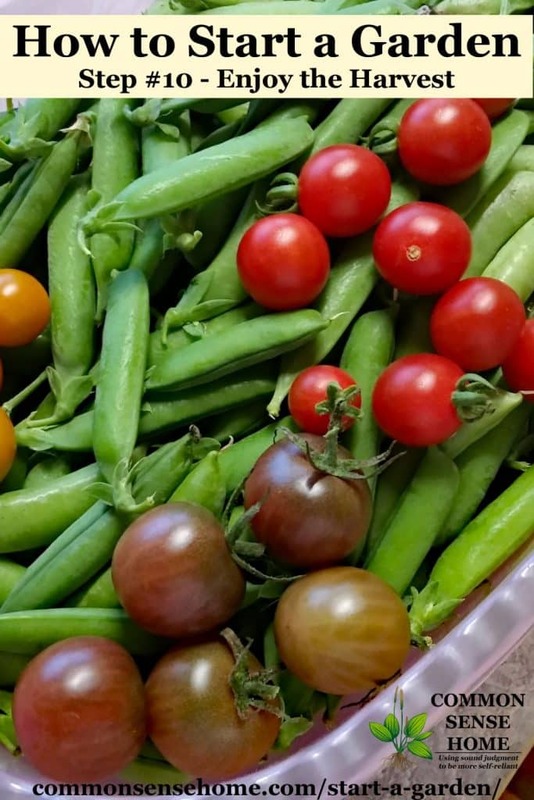 My southern gardening friend, Amber, has challenges with crops like peas, which prefer cooler temperatures, and vine crops like cucumbers, which are prone to mildew in high humidity. If you only want a small garden, don’t attempt to grow something like a giant pumpkin, which will spread over a very large area. Do you want to plan for storage vegetables, or only enough to eat fresh? It’s probably best to start your garden mainly with fresh eating in mind, but some vegetables are extremely easy to store. See The 5 Easiest Vegetables to Store for more information. 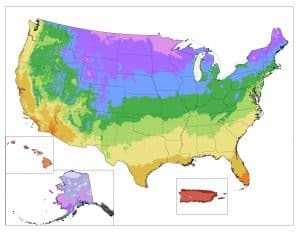 Read about Plant Hardiness Zones and Microclimate – Creating Your Best Garden. Most fruits and vegetables need full sun, with a minimum of five hours of direct sunlight per day for fruiting. Greens, herbs and root veggies will grow in partial shade. Southern gardens may benefit from late afternoon shade, whereas northern gardens likely need all the sun they can get. Think about how you will access the garden for picking, watering and caring for your plants. Out of site often equals out of mind – and often a neglected garden. Avoid high wind areas and frost pockets (low areas where frost is likely to settle). Watch out for wildlife, pet damage and children’s play areas. When we first moved here, our neighbor’s dog would randomly visit and dash through the garden. This was very hard on new seedlings. Now the dog is gone, but the deer and wild bunnies come to visit, so we plan accordingly. See Keep Deer Out of Your Garden – 5 Deer Deterrent Strategies and 6 Ways to Use Garlic in the Garden. Once you know where you want your garden, decide on the type and size of garden bed(s). Raised beds are attractive and may make it easier to work in your garden, but they also dry out more quickly. In very dry areas, sunken beds can be used to gather available moisture. Think about planting your garden in blocks or beds of plants instead of single rows. Beds should be 3 to 4 feet across – narrow enough that you can reach the center from either side. Beds should be roughly 10 feet long or less, so you’re not tempted to step into the bed and compact the ground. Within the garden beds, place plants in rows or a grid pattern. The goal is minimize walkways and maximize growing space. You only add fertilizer and soil amendments to the planting area, saving time and money. Work with companion plants to attract beneficial insects and improve yields. Start small. A small, well-tended garden can produce as much or more than a large, poorly tended garden. Make sure to give each plant enough room to grow. The seeds and transplants are tiny, but full grown plants can get huge. Overcrowded plants will have difficulty thriving. Rectangular or square beds are the most common, but you’re only limited by your imagination and building skills. Most raised bed kits are rectangular, but you can also plant your garden in found items like old livestock water tanks or sections of drain pipe. If you grow up you can squeeze more crop in less space. The best book I've found to date on the subject is “How to Grow More Vegetables, Eighth Edition: (and Fruits, Nuts, Berries, Grains, and Other Crops) Than You Ever Thought Possible on Less Land Than You Can Imagine“. I trellis/fence or otherwise grow vertically my tomatoes, beans, peas, cucumbers, and occasionally other crops. You can view how I do it in Transform Your Landscape with Vertical Gardening – 10 Reasons to Garden Up Instead of Out. Keyhole beds are round, with a single walkway into the center of the round. Sometimes a composting container or watering container is placed in the center of the round. The nutrients from the compost or the water then drain to the surrounding bed. 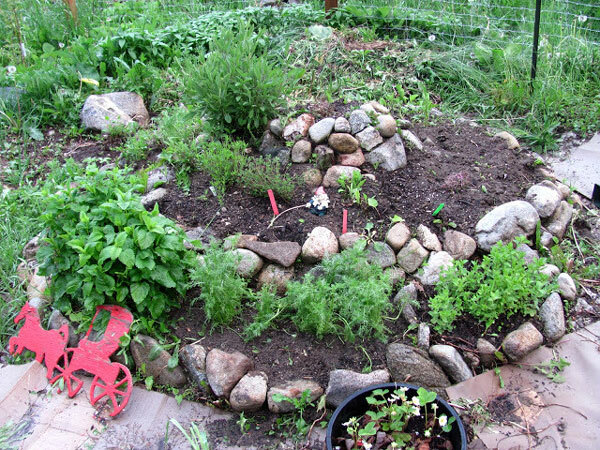 Herb spirals are popular in some permaculture circles, and may make a beautiful focal point in the yard. Generally made of stone and earth, these spirals offer a variety of growing conditions in a small space. Our main garden has a wagon wheel shape, with beds between the “spokes” of the wheel. It took a bit of time to set up, but I enjoy the view out my kitchen window. Don’t have a yard or soil for your garden? 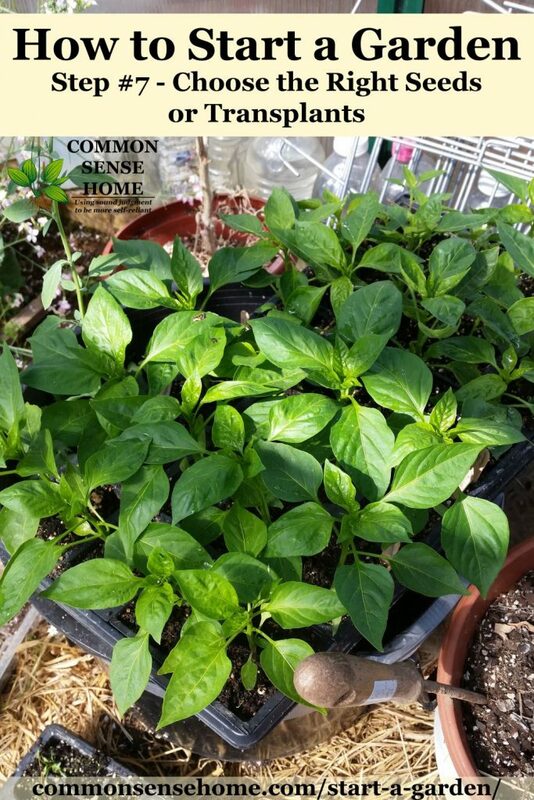 Consider grow bags or containers to start your garden. Self-watering containers are a lot more forgiving than terracotta flower pots, which tend to dry out quickly. For a full list of my favorite gardening tools, check out, “My Favorite Gardening Tools – Save Time, Boost Yields, Enjoy Gardening More”. Don't buy cheap plastic tools if you can avoid it. Shop yard and estate sales for bargains on real metal tools, or visit your local garden center. Get tools that are the right size for you to reduce the risk of injury. Good tools will save time and effort, and your back. Keep tools clean and sharp, just like you should treat a good knife. To learn how to keep your tools in good condition, visit “Cleaning and Sharpening Garden Tools”. Before you start building your garden beds or planting, you need to know something about your soil. Is it acidic, alkaline or neutral pH? Is your soil mostly sand, clay, silt, or a mix of the three? Are there a lot of rocks? Is there a risk of soil contamination from nearby structures, roadways or other sources? Does it have a good amount of basic nutrients? 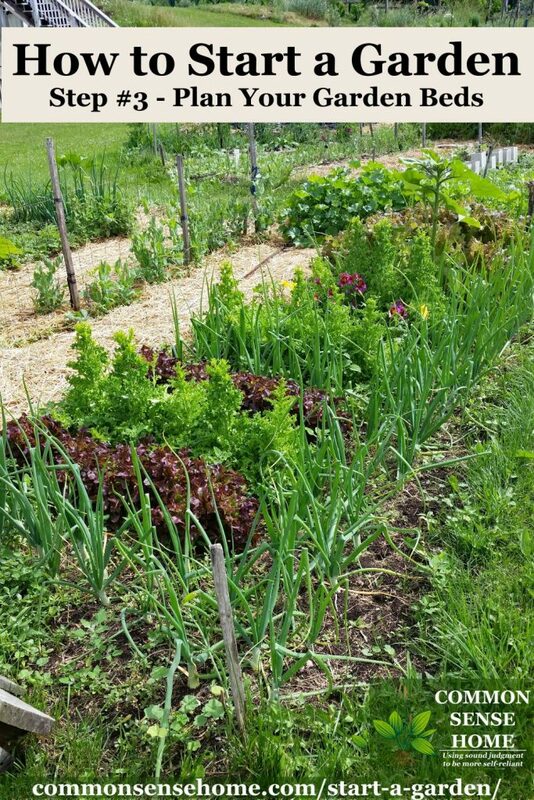 Most garden crops prefer soil with a pH around 7 (neutral), although some like conditions that are slightly acidic (potatoes, for instance) or slightly alkaline (brassicas). Balanced nutrient levels are also important, as is the presence of organic matter. A basic home soil test kit can be found online or at most hardware stores for around $10. The Rapidtest soil test tests pH, nitrogen, phosphate and phosphorus levels. Soil pH can also be tested with a simple pH meter. In the U.S., you can contact your local cooperative extension office or land conservation office for assistance. A simple mason jar soil test will help you identify sand, clay and silt in your soil. Fill a mason jar about half full of garden soil. Add water to about one inch from the top. Allow contents of jar to settle for several hours. Examine the layers that form in the jarred soil. The bottommost layer will be sand and rocks. Next up is the silt layer, and finally on top is the clay layer. Organic matter (such as leaves or twigs) may be floating in the water. Loam is roughly 20% clay, 40% silt and 40% sand, and is considered the ideal soil proportion by many. More clay means that your soil is more likely to hold and trap water. Lots of sand means faster drainage. If you have too much of either, it will make gardening more challenging and soil building even more important. If you're starting with sod, you'll either need to cut it up in chunks and repurpose it, till it in, or lay down wet newspaper or cardboard to smother it and build a bed on top. Preparing in fall is best, but don't let that stop you from starting in spring. Most plants prefer a deep, well-drained, fertile soil rich in organic matter. Once you start a garden, you’ll gain a new appreciation for healthy soil as it improves year after year. Healthy, vibrant soil = healthy, vibrant plants with built in disease and pest resistance and more nutrition. 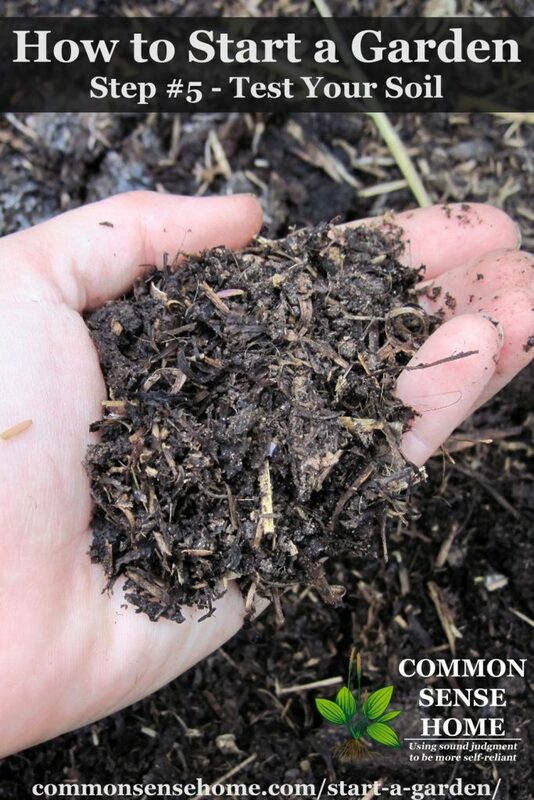 Start with the basics, like compost and mulch, and then experiment based on experience or soil tests. I also add rock powders, use cover crops, weed tea, and other fertility boosters. Microbial inoculants can also do amazing things for plant and soil health. There’s a whole world of tiny soil critters to explore. My favorite seed sources can be found in the article, “My Favorite Seed Sources, Seed Storage and Germination“. Dave's Garden Watch Dog is a great place to check out a company before you order from them. To learn which plants grow best directly seeded in the garden and which plants are better as transplants, visit the seed starting calendar. 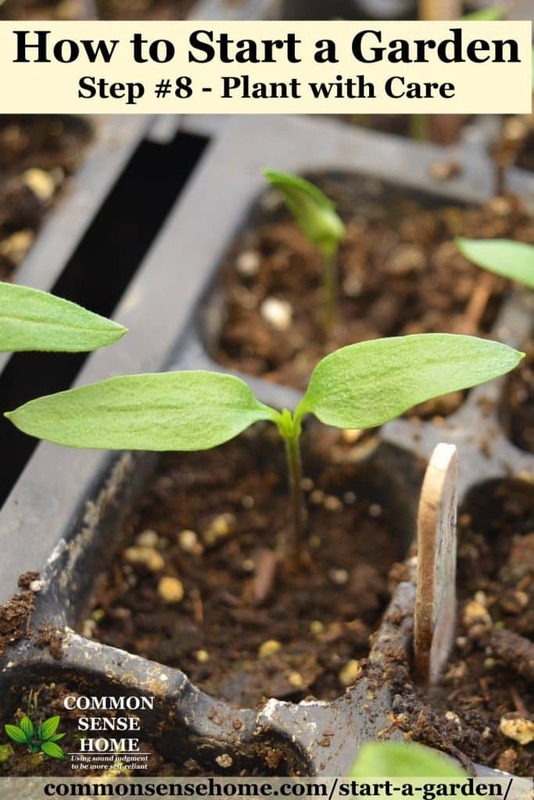 If you want to grow specific varieties, especially heirloom varieties, you'll probably need to grow your own transplants from seed. Starting your own transplants is a great way to save money, too. You can view my seed starting setup in the post Seed Starting Setup, and view more detailed information on tomato transplants in Grow Tomatoes from Seed – Save Money, Get More Varieties. Look for pots that are roughly equal in size to the plant. Big plants in tiny pots are more likely to be root bound (with roots tangled and growing in circles inside the pot) and suffer from transplant shock when planted in the garden. Watch for signs of stress such as insect damage or yellow leaves. Many stores now set up seasonal plant sales in their parking lots. Even with regular watering, baking asphalt is hard on seedlings. Ask whether or not your plants or seeds were treated or sprayed with potentially harmful chemicals such as neonicotinoid pesticides. Pollinators are critical for fruit set in the garden, so you don’t want to buy plants that may harm them. Most seed packets and transplant containers come with basic planting instructions. Once you've done the ground work (literally), you just need to jump in and plant. Just give it a try and you can learn the rest as you go. Plant seeds roughly 3 times as deep as the diameter of the seed, unless otherwise directed on the package. Some seeds require light for germination. For transplants – most transplants are planted at the same depth they were growing in the pot. The exception is tomatoes, which can be planted deeper or trenched in. See “How to Grow (Lots of) Tomatoes Organically”. Wait until danger of frost is past to plant heat loving plants such as tomatoes, peppers, cucumbers, okra, etc. Young plants are more tender than older plants, so they may need protection or hardening off when they are planted outside. We have printable calendars to help you plan your seed sowing in the article, “When Should I Start My Seeds? Printable seed starting calendar”. The 5-Minute Gardener: How to Plan, Create, and Sustain a Low-Maintenance Garden is a good reference for those who are short on time. 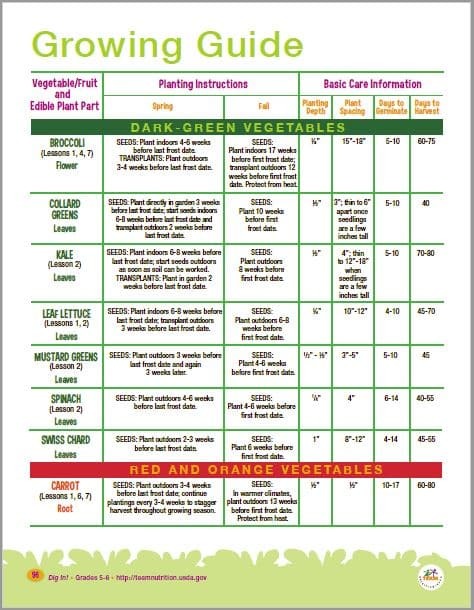 You can also click here or on the image below to download this handy pdf excerpted from the USDA school garden program that shows planting depth, plant spacing, days to germination and days to harvest for a variety of common garden crops. There's an old saying that says, “The best fertilizer is the gardener's shadow.” If you're not prepared to make time in your schedule to tend to your plants, you may be better off hitting the farmer's market, or sticking with extremely low maintenance items like sprouts or herbs. Depending on the size of your plantings, time requirements may range from a few minutes per day to a full time job. Nab weeds when they’re small with a scuffle hoe – or use them as groundcover, food or medicine. See 5 Reasons I Want Weeds in My Garden. A rule of thumb for watering is that plants need around one inch of water per week during the growing season. If you don't get rain, you'll need to water. Over watering is as bad as under watering, so always check the soil before turning on a tap or hitting the rain barrels. Soil that is too wet can cause seeds and roots to rot. Foliar feeds like compost tea can be added to give plants extra nutrition and a dose of healthy microbes while watering. Bugs are more attracted to plants that are stressed or in some way deficient, so if you have healthy, well-nourished plants, your pest problems should be minimal. If you have a problem, chances are there's an organic solution. If you're going through all the effort to grow your own food, why would you want to put toxins on it? For more detailed information on controlling everything from slugs to rabbits, check out Natural Pest Control in the Garden. For quick control of soft bodied insects like aphids, check out Homemade Bug Spray for the Garden – 3 Easy Recipes. As crops mature, make sure to harvest promptly for best quality. Leafy greens like lettuce are typically “cut and come again”, which means you can clip off the leaves and they will regrow for another harvest. Pick beans and peas every two to three days. Harvest sweet corn when cobs are well filled out and silk is dark. Harvest tomatoes and peppers green, or allow them to ripen to full sweetness and flavor. Flavor is typically at a peak when the morning dew has cleared, but before the afternoon heat has settled in. Sample and decide what tastes best to you. See How to Grow and Cook Nutrient Dense Foods for harvesting and storing tips. One of the reasons I love gardening is because if things don't work out right the first time, there's always next year. There are dozens of different ways to do just about everything, but you won't know what works best for you and your garden until you try. If a plant/crop does poorly the first time you plant it, try again. I usually try a crop for at least three years before I give up on it, because different varieties grow best under different conditions. Gardening is also good for your health. It can fight depression, reduce stress and improve your diet. See “Dirt Therapy – 8 Reasons You Need to Have a Garden” for more information. Still have questions about how to start a garden? Leave a comment and I’ll do my best to help. I updated your address in my blog roll. Thanks for the heads up. I see you through followers, so did not note the change. I’m working on some baking and venison recipes this weekend. I can’t get around too fast yet, but my kitchen is small and I’ve some game meats folks brought me after I had my knee surgery. I might be slow, but it will still be fun. That reminds me, I seriously need to make some venison jerky, as I, too, was blessed with meat from hunting friends, but thankfully not knee surgery. Heal fast, and thanks for making contact and updating the link. Excellent advice! this is a great post for new gardeners, I will be passing this on, as I’ve had a few questions from people about where to start, and sometimes its hard to know what to tell them. I think you covered everything in one post, well done! It’s amazing how useful these plants that so many people hate can be. Excellent article for beginners out there who want to start gardening. Thanks for sharing a great post. After growing up in a family that gardened, your post hit all the top points on starting a garden! A lot of great tips for people who are new to gardening. In my my opinion, one of the main factors that any new gardeners need to concentrate on is the soil. If they could improve and maintain the fertility of the soil then they will not be facing many problems in their gardening activities including the pest problem and will increase their chances to success. Best blog to check out if you are a beginner at gardening, this is great advice to know. 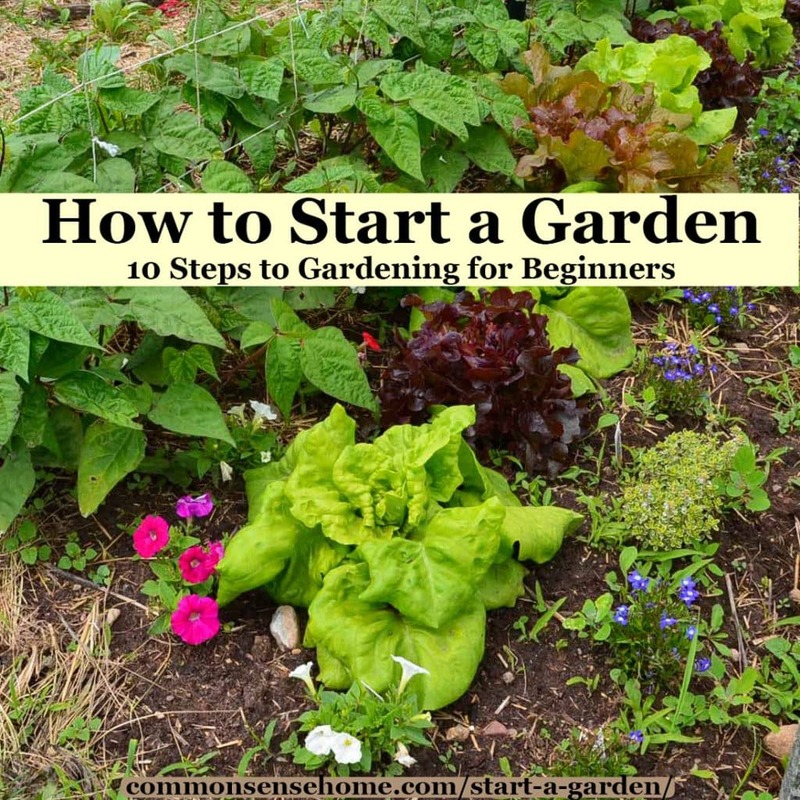 I love how simple these steps are to follow and not so complicated so it makes it alot easier for those who are learning to start their very own garden. Thank you for sharing such a great informative article! I’m starting with gardening and honestly this article has helped me a lot. Thanks for sharing ! Thank you for sharing good Gardening tips for beginner. Very useful getting me a idea about Home Gardening. I want to be shared ur post with my friends.